To understand how the recent upswing in job growth might feel for the American worker, we need to put the growth in context. After all, adding 200,000 jobs in an economy of 80 million feels a lot different than adding 200,000 jobs in an economy of 160 million. But we can scale historical job numbers by the size of the workforce such that they are comparable to job numbers in 2015. For the presidential election, the incumbent party should aim for 185,000 jobs per month, with an average for reelected parties at 310,000 per month. 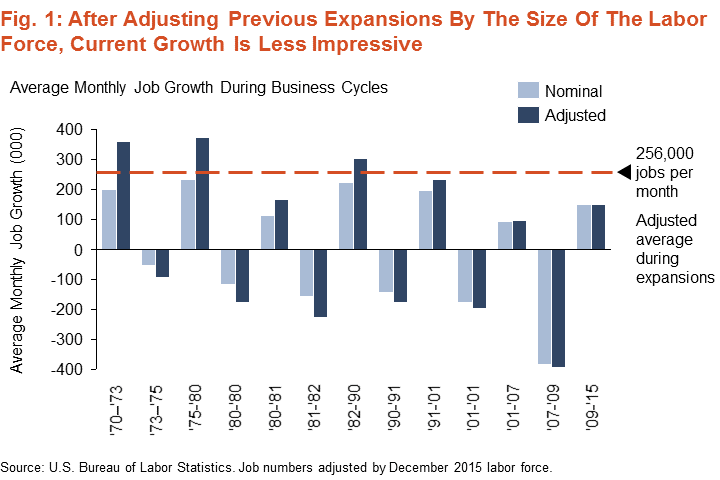 With 221,000 new jobs per month, 2015 job growth was above average of recent recoveries.